"Pacquiao's best talents are singing, promoting Hennessy, and planking" - Broner. At the press conference today. A little part of me wants to see Broner win just so he gets another big fight against the likes of a Thurman, Spence or Crawford. But I find it impossible to route against Manny. who's watching this chit then? That is some Lewis Holyfield type bull**** right there. Boxing is so rigged. A rematch and more money is more important than the result that was actually deserved. Lost credibility yet again. That hometown points for Wilder was a joke 115 how?? First off what an amazing fight but the judge who scored that for Wilder needs to be taken out the back and shot. He's the reason I drifted away from Boxing many years ago..
After it took so long to get the scores I knew it would be a draw or spilt. It’s just ridiculous it keeps happening. The reaction from the fans in the arena, the ringside pundits, and Tyson Fury tells you all you need to know about who won the fight. He made Wilder look like an amateur the entire fight except for the two rounds where he got his knock downs. How anyone could score that for Wilder is beyond me. He boxed the face of Wilder lol, it was a hell of a knockdown and I didn't expect Fury to get up after it but that and the other one he got were literally all he did the entire fight. Alright European kids, let's cut the cliches and stop regurgitating the same nonsense. Wilder spent 36 minutes in the ring with a dude that weighed 400 pounds fairly recently and all he had to show for it was a mouse under his eye. I understand we've all been conditioned to appreciate point fighting in boxing, but if it was you who landed a knockout punch and a guy woke up, walked off, and his buddies claimed victory, your jimmies would never recover. I get it, you all were cheering for Fury. But take it from a guy who didn't give a damn either way, that fight was nothing to sleep over. One guy landed a ton of fairly soft jabs, and the other guy knocked him out at one point. Then it was ruled a draw because LOL boxing is retarded. Wilder only won because he was in the US everyone knows it, end of. I can't stand Fury lol either winner set up a big fight with AJ Britain vs. Britain fight with Fury or a big America vs. UK fight with Wilder. But now I have to sit through that fight again due to blatant corruption. This is another one that we've got to be smart enough to get past. We can't keep regurgitating the same stupidity. A British judge, a Canadian judge, and a Mexican judge (Alejandro Rochin, the one who scored it for Wilder) in an arena that had to be 60/40 Fury fans did NOT deliberately help an American **get to a draw on the scorecards** just because it was in Los Angeles. You're going to have to get something better than that. 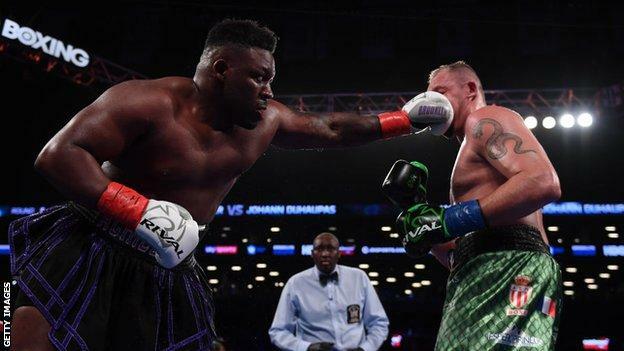 A British judge, a Canadian judge, and a Mexican judge (Alejandro Rochin, the one who scored it for Wilder) in an arena that had to be 60/40 Fury fans did NOT deliberately help an American ﻿**get to a draw on the scorecards** just because it was in Los Angeles. You're going to have to get something better than that. You can call it what you want lol it was a robbery. One of them was snoring for about the same amount of seconds as punches that the other guy landed. Neither of these guys has a gripe. The fans have a gripe. The sport is stupid. It's scored poorly. It's quite often rigged. It's the most corrupt sport on the planet. Then I'm supposed to be outraged over the same chit that has been happening my entire life in boxing? Give me a break. Oh sorry, I didn't realize I had to be emotional to have a discussion. I'll see my way out then. This fight reminded me not only of the Lewis v Holyfield fight, but the first JMM vs Pac. Marquez was floored 4 times in the first round and then won every round after that but was only given a draw. And as for your knocked unconscious point, whether he was or wasn't, he beat that the count. People keep saying this, and maybe I'm wrong, but is the ref not supposed to wave off the fight and deny the ten count if the guy is literally unconscious? I'm not going to pretend to have read the rulebook here, but I seem to remember people being denied a ten count. People keep saying this, and maybe I'm wrong, but is the ref not supposed to wave off the fight﻿ and deny the ten count if the guy is literally unconscious? I'm not going to pretend to have read the rulebook﻿ here, but I seem to remember people being denied a ten count. He beat the count and the ref rightfully deemed him well enough to fight on. The fact Wilder was holding on for dear life by the end of the round proves this point. It doesn't really though. We're on a combat sports forum. We've seen plenty of guys shake off the cobwebs, and come back to win. The fact that he continued to outbox potentially the worst technical boxer on the planet does NOT mean he wasn't literally snoring. This is a fruitless argument though. I've already admitted Fury was the better boxer on the night, but fangirls can't face the fact that their boy was asleep. Oh well. They just better hope Wilder doesn't start winging those homerun shots in the first round next time. Fury won't make it out of there if he does. I agree it's fruitless. It's academic whether fury was unconscious because the rules only state you have to beat the 10 count. Don't know if I'm classed as a fan girl but he looked out to me, but so what? It's one of the fundamental flaws in boxing if you ask me, which is why I vastly prefer mma. Those are the rules under which they fight though and to be fair, Tyson's terminator- like rise from the floor was pretty heroic. Btw, to be specific about the rules from your earlier point, fighters will be denied a 10 count if it's their 3rd knockdown in a round. The referee can also stop the fight if a fighter is not in a 'position or condition' to defend themselves. So had fury looked even slightly like a walking punch-bag after he got up, the ref would have undoubtedly stepped in. It was that rule by which the Conor/Floyd fight was stopped. You owe me 10 minutes of my life back for reading the whole bloody boxing rule book. Truthfully, I've watched about 2% of the amount of boxing matches that I have MMA fights. And a majority of those boxing matches were Mike Tyson fights as a kid. So I just remembered mother****ers laying prone on their back or stumbling around unable to fight and it being waved off. I thought for sure when the ref dove in for chest compressions on Fury that it was over. But hey, at least I've finally deduced how so many more people die in the boxing ring. All is not lost here. Come on, man. Get a grip. Show me a clip of the knockdown and the count. Watch Fury lay there literally snoring for the first couple seconds when he flung to the mat. My emotional involvement with this issue is literally zero, so I don't know what your angle is supposed to be, or why I'm supposed to be making this up. But it's sort of weird now. Btw, just so we're clear, I'm a fan of Tyson Fury, the person. Think the guy is an absolute badass. Love his personality. What I didn't love is watching Muhammad Ali in his later years. The Holmes fight is still tough to watch. So my outrage at Fury being knocked out, and then being allowed to continue fighting despite it, was really only because I don't want to see more people end up like Ali. Especially not Fury. That's all. Was listening to Schaub's podcast last night and one of the first times I had to turn it off the guy is so clearly trying to push a narrative it's unreal. Went on like 30 minute rant about how if you think Fury won the fight casual or pro then you don't know chit about boxing. Which to be honest I would accept if it was only me who thought he won but pretty sure Lennox Lewis has forgotten more about boxing than Brendan will ever know. What made it come of as worse was that it sounded like he didn't believe what he was saying himself. Adonis Stevenson sounds like he's in a very bad way right now. any chance Canelo fights another top 50 fighter in his career? 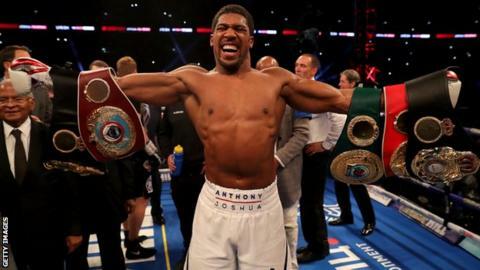 Rocky had big reach... proceeded to stand in the pocket all "fight"
Anthony Joshua will get the chance to create an "iconic moment" in New York as a deal to fight Jarrell Miller draws closer, says promoter Eddie Hearn. The unified world champion was due to fight at Wembley on 13 April but the date will almost certainly be scrapped. Instead, Hearn says facing New Yorker Miller at Madison Square Garden on 1 or 8 June is "likely". "I really believe it will be a major moment for Joshua's career," Hearn told BBC Sport. Miller, 30, has 23 wins (with 20 knockouts) and a draw to his name but has never met anyone of Joshua's pedigree. His best wins up until this point would probably be against Johann Duhaupas a former Eurpoean Heavyweight champion who holds wins over Maunel Charr, Robert Helenius and has fought Deontay Wilder and Alexander Povetkin. As well as Tomasz Adamek, a former Lightheavyweight and Cruiserweight champion who once fought for the Heavyweight title. How do you think this one goes? Dude is 5-0 against people with a Wikipedia entry. I assume Joshua will win but this is not an iconic fight. We ain't going to be talking about Ali/Foreman, Tyson/Holyfield and Joshua/ Miller in years to come. The draw between fury and wilder has left him a bit out of decent options tbh. I assume Joshua will win but this is not an ﻿iconic fight. We ain't going to be talking about Ali/Foreman, Tyson/Holyfield and Joshua/ Miller in years to come. Yeah it favours Joshua and I agree likely won't be a classic but tbh I kind of understand him taking this fight. Fury & Wilder need to rematch so there out. Charr is fighting Oquendo the end of March so neither of them are available. Same with Pulev. Trevor Bryan, Agit Kabayel, Otto Walin and Adam Kownacki have fought even fewer real contenders than Miller so you can't really put them in there yet. Depressingly, I wouldn't be surprised if we never see two of the 3 undefeated heavyweights in a ring together. They've all signed tv deals with rival companies so it's going to be harder and harder to get a deal done. In meantime no doubt the relevant boxing boards will line up a bunch of mandatory challengers that nobody has ever heard of. Yeah wouldn't be surprised if we don't. I think the only one of the three can really force a fight is Fury because Wilder & Joshua are just going to listen to what there people tell them to do. Joshua will get paired with Pulev or Charr who are both vets but it doesn't exactly set anyone's hair on fire and Fury's gonna get booked against another Top Rank/ESPN guy probably Rivas or potentially Joseph Parker. The only good one that might come of it is Dillan Whyte might now get a crack at Wilder. It definitely does make me appreciate MMA even more, can you imagine if Jones, DC & Gustasson were all in a similar situation and had never fought. t-rex arms vs glass hands. Malignaggi signed with BKFC. Same organization that has Artem vs. Hick Diaz coming up. They said if Artem wins, he'll fight Paulie. Paulie must be going broke or some chit if he's signing up do this.